Alfreton Town fought back from two goals down to draw 2-2 at Coles Lane against a game Sutton Coldfield side in a tale of two halves in the FA Cup on Saturday. Billy Heath brought Tom Platt, Curtis Bateson and Craig King back into the side with Danny Clarke making the bench. 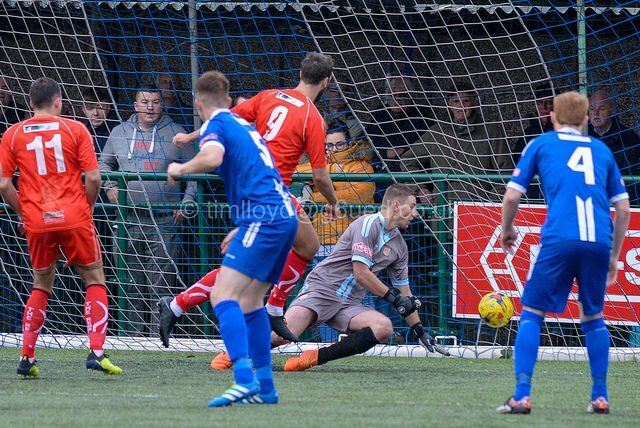 However the game started in the worst fashion for the Reds as they trailed after just two minutes, Jon Letford raced through on the left in behind James Clifton and the striker produced a composed finish under Sam Ramsbottom to give the hosts a dream start. It got even better for Sutton after just six minutes when Lee Smith turned well inside the box and flashed a shot into the bottom left corner to leave Alfreton stunned. The Reds were yet to settle into the game and a lack of concentration at the back resulted in a huge mountain to climb after such little time played. We generated our first big opening after 13 minutes when Nathan Hotte glanced a header onto the far post from Jordan Sinnott's corner. Another corner came in from Sinnott which caused a scramble before Richard Peniket's shot was blocked. King then fired over the bar with a first time effort from yet another Reds corner. Ramsbottom then produced a fantastic and vital point blank save to deny Letford his second and Sutton's third of the game on 25 minutes. Another ball forward wasn't dealt with and Letford capitalised on the loose ball but Ramsbottom saved from point blank range in the box. James Clifton struck the post from distance as we continued to push for a goal back before the break. Luke Shiels nodded a Sinnott free kick goalwards towards Josh Gowling but the offside flag went up, Hotte's effort in the box was blocked nad was easy for Hopkins. The second half saw a totally different Alfreton, who no doubt would have been given harsh words from Billy Heath and immediately came out with impetus. With 53 minutes gone, we pulled one back; Clifton's long throw from the right caused problems and the ball fell nicely for Peniket who stabbed home from a few yards out to give the Reds a lifeline in the tie. Curtis Bateson won countless corners during the second half and was a menace throughout, Peniket tested Hopkins again from a Bateson cross but the Royals goalie held onto the shot well. After 61 minutes the Reds levelled, Declan Bacon, who was introduced at the start of the second half hit a wonderful effort into the top corner from outside the box to the delight of the Reds faithful behind the goal. Hotte fired over the bar before Bateson flashed a cross all the way through the box as Alfreton hunted for a third goal. Shiels narrowly missed connecting with a Sinnott free kick, Peniket went down in the box late on but the penalty claims were waved away. The Reds huffed and puffed but had to settle for the draw and a Replay on Tuesday night. After a woeful first half, the Reds dug in and showed excellent spirit to fight back from two goals down and earn a replay, but will ultimately be disappointed to not have taken the game by the scruff of the neck from the start. The winners of Tuesday night's replay face a trip to Mickleover Sports in the Third Qualifying Round. ALFRETON: Ramsbottom, Wilde, Clifton, Platt, Gowling, Shiels (C), King (Bacon 45), Hotte, Peniket, Bateson, Sinnott (Clarke 86).